If Aristotle was referring to Chocolate-Peanut Butter Marbled Biscotti when he said, “The whole is greater than the sum of its parts,” he was right. Peanut butter and chocolate are tasty flavors on their own, but rise to a higher level of deliciousness when swirled together into one crunchy biscotti, perfect for dipping or munching. Last week, I was in South Carolina visiting my mother. I often bake something to bring to her. She is delighted with whatever I bring, simply because I made it, and she enjoys having something sweet with her coffee. Chocolate and peanut butter are two of my mom’s favorite flavors and she is a huge fan of biscotti, so Chocolate-Peanut Butter Marbled Biscotti seemed like a good choice. However, when I got to South Carolina, I remembered that my mother was having major dental work done and wouldn’t be able to bite or chew anything hard for a few days. The biscotti are crunchy and my mom didn’t have usable teeth. A soft loaf cake might have made more sense. 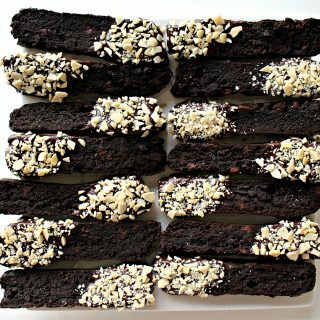 Luckily, Chocolate-Peanut Butter Marbled Biscotti are delightful when dipped in coffee to soften and eat. When chewing isn’t a problem, these biscotti are just the right texture to munch on without dipping, if a cookie with crunch is preferred. While developing Chocolate-Peanut Butter Marbled Biscotti, I learned a few things about baking with peanut butter. Nut butters contain a lot of fat and can often be substituted in part or full for the butter called for in a recipe. In biscotti recipes, the amount of butter used influences the crunch factor. Biscotti recipes without butter, produce a very hard cookie that almost requires dipping in order to eat them without breaking your teeth. Varying amounts of butter produce varying amounts of softness to the biscotti. I found that if peanut butter replaced all of the butter, the resulting biscotti tasted great, but were rock hard. A 50/50 ratio produced the munchable crunch I like best, but the peanut butter flavor was very mild. To increase the flavor while keeping the texture, I added chopped peanut butter chips. The chips are essential to give discernable peanut butter flavor to the biscotti. These chips can be found in the baking aisle with the chocolate chips and are manufactured by house brands as well as Reeses, Nestle’s, and several organic brands. I chopped the chips into smaller pieces in order to distribute the chips throughout the dough and to make slicing the biscotti easier. 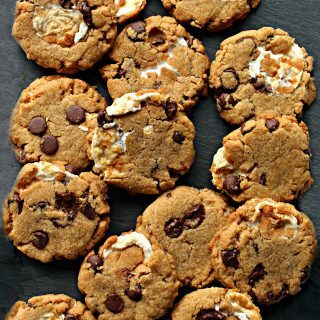 If you don’t have access to peanut butter chips, an alternative can easily be made at home, using the same proportion of white chocolate and peanut butter that I use in the decorative topping in this recipe ( 1 cup white melting chocolate to ¼ cup creamy peanut butter). Melt the white chocolate and peanut butter together and mix to combine completely. Then spread the mixture on a wax paper lined baking tray to about 1/8”- ¼” thickness. Refrigerate until firm, then chop into peanut butter chip bits. Creating the beautiful marbled effect required some trial and error experiments. Simply piling layers of dough produces a striped, zebra look. I wanted more uneven swirls. The answer, is to be unafraid of mushing and squooshing the peanut butter and chocolate layers together while stretching and pressing to form the dough log. There may be more formal culinary terms, but mushing and squooshing is what I did. 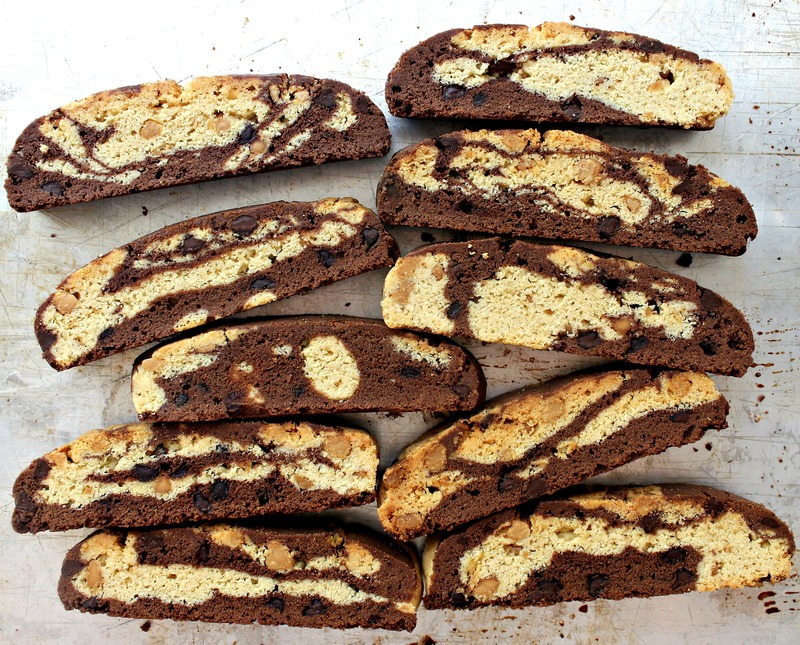 The result was marbled biscotti, each one unique and different from the other. 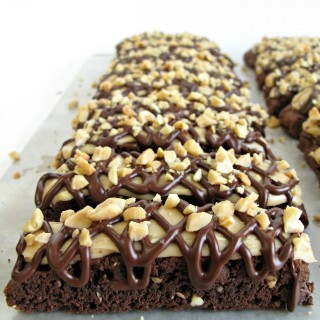 The easy chocolate and peanut butter topping adds extra eye appeal to the biscotti, but is completely optional. 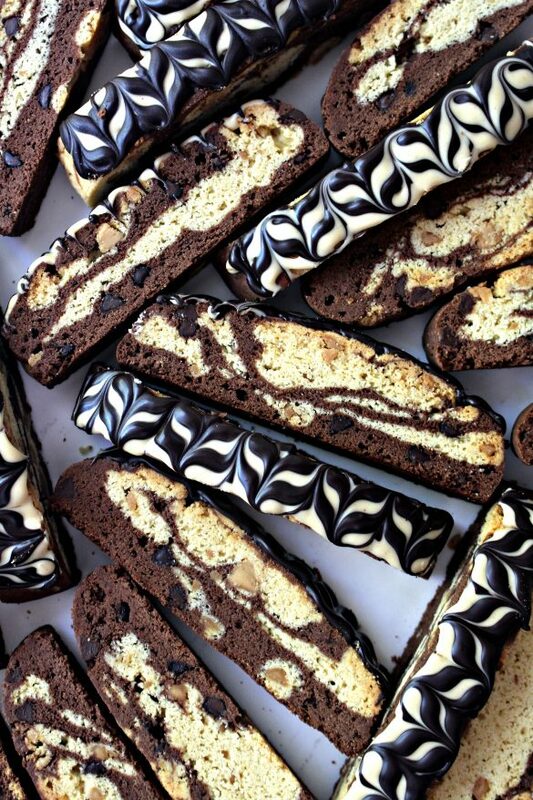 The flavor of Chocolate-Peanut Butter Marbled Biscotti is great all on its own. 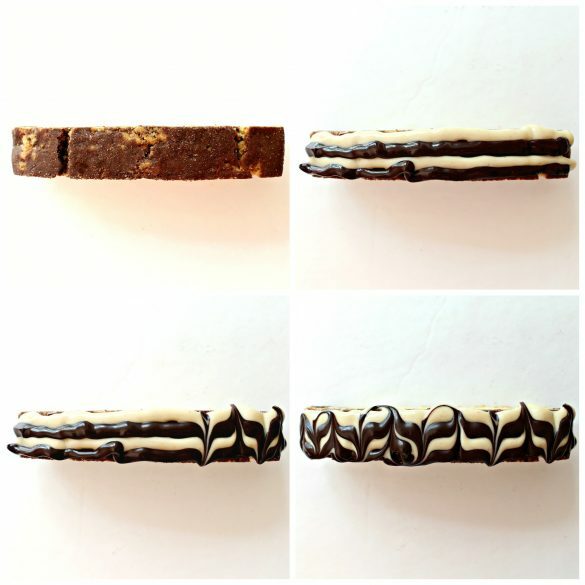 To create the topping design (like on a classic Napoleon),pipe four stripes of melted chocolate (alternating flavors) across the length of a biscotti. Use a toothpick tip to drag upward, then move over about ¼” and drag the toothpick tip downward. Continue the upward-downward pattern across the biscotti. 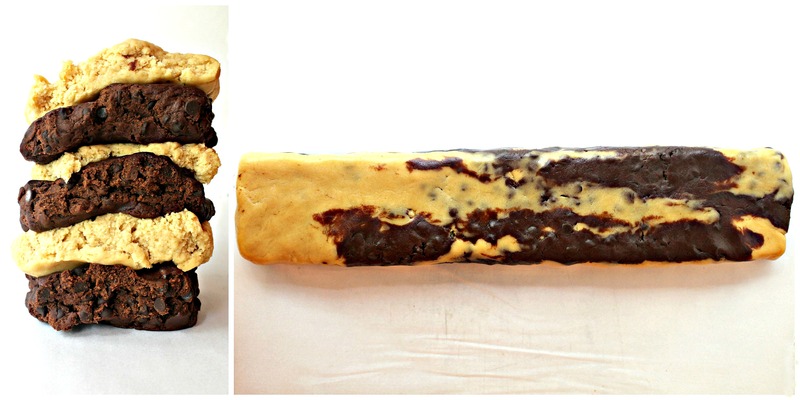 Chocolate-Peanut Butter Marbled Biscotti are a beautiful food gift and a delicious treat! Their long shelf-life makes them ideal for baking ahead or shipping distances. The wonderful crunchy texture is just right for munching or dunking. Happily, the recipe makes enough to gift some and keep some! In the bowl of an electric mixer, cream together butter, peanut butter, sugar, salt, vanilla, and baking powder. Beat in the eggs one at a time. The dough may look curdled, but is fine. Gradually add the flour until combined. 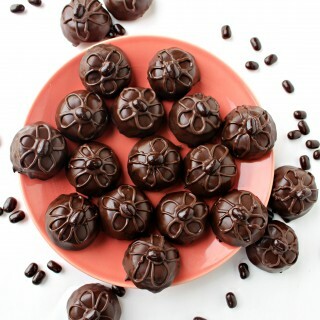 Wrap the peanut butter dough in plastic wrap and refrigerate while making the chocolate dough. In the bowl of an electric mixer, cream together butter, sugar, salt, and vanilla. Beat in the eggs one at a time. The dough may look curdled but is fine. 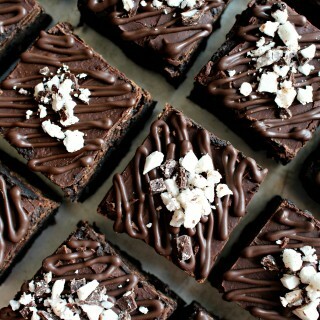 In a medium mixing bowl, whisk together the flour, baking powder, cocoa, and espresso powder. Gradually add the flour mixture to the butter-sugar mixture, mixing until combined. Remove the peanut butter dough from the refrigerator. The dough will be formed into two logs. To form one dough log, use one half of the peanut butter dough and one half of the chocolate dough. Divide each dough flavor portion into thirds and press the thirds into thick discs. On the prepared baking sheet, stack the discs, alternating flavors. Press, stretch, and mush the stack into a log approximately 14” long and 2” wide. Repeat using the remaining dough to form a second dough log. Place logs about 4” apart on the prepared baking sheet. Bake for 25 minutes, then remove from the oven and allow to cool on the baking sheet for at least 30 minutes (or as long as overnight). Reduce the oven temperature to 325°. Place the logs on a cutting board and use a serrated knife to cut the biscotti into ¾” slices (approximately 16 biscotti per log). Stand the biscotti on the parchment lined baking sheet with a small space between each. Return to the oven for 30-40 minutes or until just beginning to turn golden. Biscotti will continue to firm up as they cool. Cool completely on a wire rack before decorating or storing. In a small bowl microwave melting chocolate at 50% power for one minute or until melted. Spoon the melted chocolate into a small ziplock bag. Set aside. I another small bowl, microwave the white melting chocolate and peanut butter at 50% power for one minute or until melted. Stir until the white chocolate and peanut butter are completely combined. Spoon into a small ziplock bag. Line a small baking tray with wax paper. Stand a biscotti on the tray. Cut off a bottom corner of each chocolate filled ziplock bag. Pipe alternating stripes on the top of the biscotti, two of each flavor. Starting at one end of the biscotti, drag the tip of a toothpick down through the stripes. Move over about ½” and drag the toothpick tip in the opposite direction, up through the stripes. Alternate dragging the toothpick down then up across the length of the biscotti. 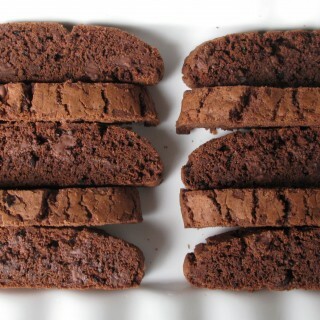 After completing about 6 biscotti, place them in the fridge for about 10 minutes or until the chocolate is set. 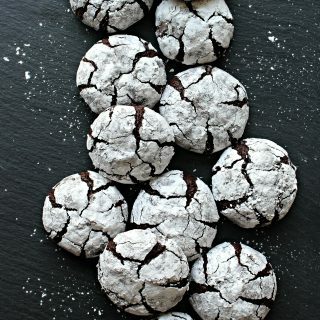 Repeat until all biscotti are decorated and the chocolate is set. 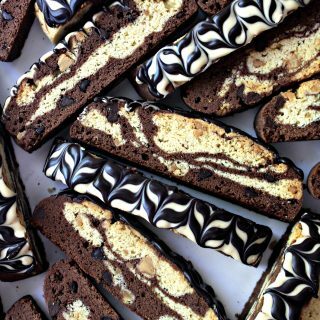 Without chocolate topping, Peanut Butter and Chocolate Marbled Biscotti will stay fresh for up to one month with only slight softening over time. With chocolate topping, store for up to 2 weeks. Do not add chocolate-peanut butter decorative topping to the biscotti if mailing to or from a hot location. Double wrap two or three biscotti in plastic wrap, cut sides together. Place bundles in an airtight container or ziplock bag. 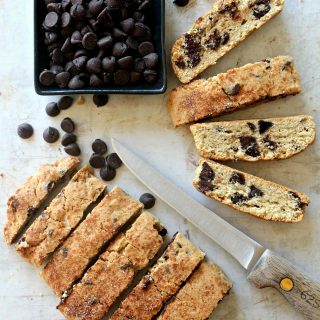 Looking for more biscotti amazingness? Readers have especially enjoyed these recipes. Take a look! Wow – these are a must make for me Wendy! My favorite combination of peanut butter and chocolate must be a real winner in these lovely cookies. You are an artist and from top to bottom these cookies are mesmerizing! As a great biscotti lover, this version is so captivating to me! Love the combination of chocolate and peanut butter, plus you really decked it out with the chips and that fabulous eye-catching topping. It’s all in the details and I love how thoughtful you are about the recipe. The biscotti look amazing and I’m sure they taste fabulous. This is surely a recipe worthy of mom and I know she appreciated even if she was having a little trouble with her teeth. : ) Hope you had a great 4th! Thanks, Monica! I’m a biscotti lover too. Not only are they great with coffee or tea, but they ship like a dream in care packages! The chocolate chips are an indulgence, but the peanut butter chips were required to get real peanut butter flavor. My mom did enjoy her biscotti, because luckily, they also soften without disintegrating when dunked! Have a great weekend! 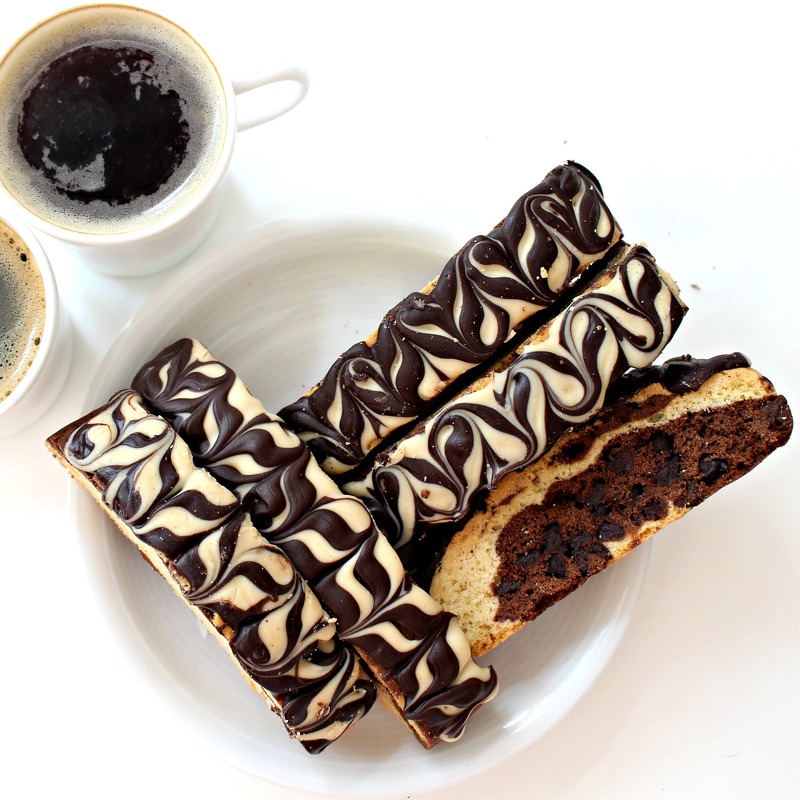 I am wishing I had one of these beautiful biscotti right now along with a cup of afternoon coffee. 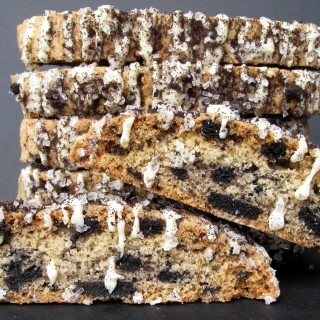 What a wonderful combination of flavors for biscotti! Thanks, Chris! Chocolate and peanut butter are made for each other, aren’t they? 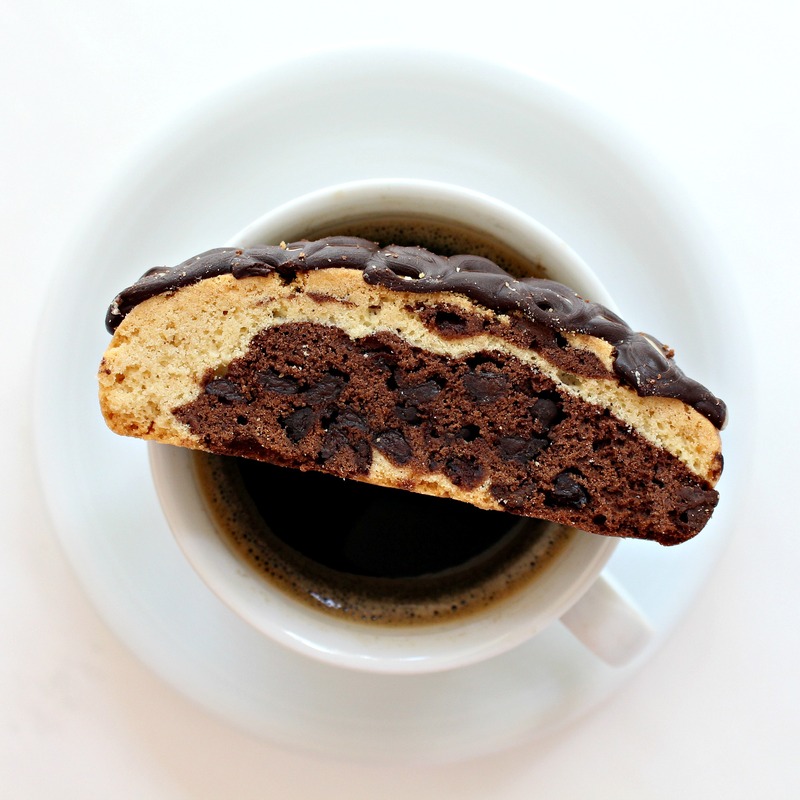 These biscotti are great with a cup of coffee….or hot chocolate! I love that the secret to a well marbled peanut butter-chocolate biscotti is the same as the secret to a well lived life- be unafraid!! These are beautiful biscotti. Your mom is a lucky woman. Thanks, Cindy! You are very philosophical and wise. I think that in life,we sometimes regret the things we do, but more often we regret the things we didn’t do…often from being afraid. What better way to ponder the deep things in life, than over coffee and biscotti! Wow these biscotti are just beautiful! I love the marbling effect on top, so stunning. 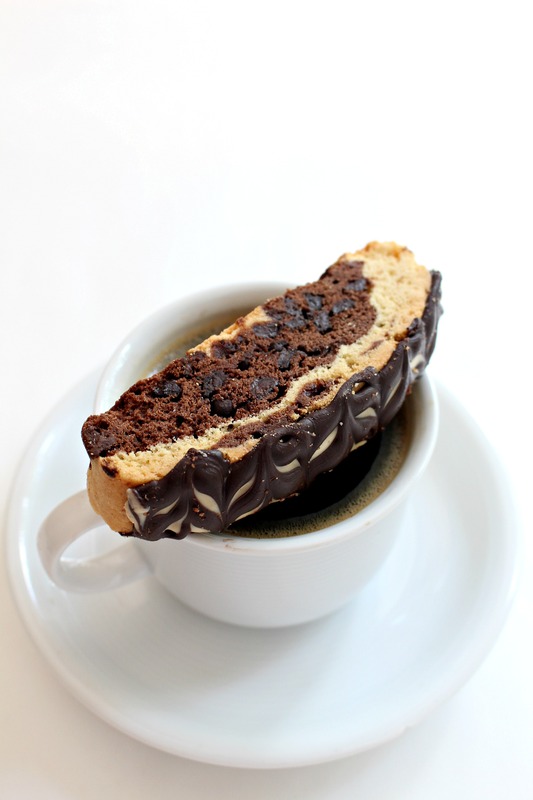 I love a great Biscotti with my afternoon tea, this will be awesome! 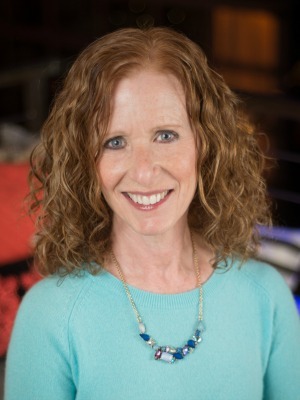 Thanks so much for sharing your post with us at Full Plate Thursday this week. Hope you will come back and visit us again real soon! Wow, these biscotti look so yummy. I love biscotti but don’t make it often. I liked all of your tips. Stop by Over The Moon on Sunday since you are my feature. This is the most delicious biscotti I have seen! Wow! Pinned your recipe. We are so happy you linked up with us at the #HomeMattersParty this week! These are gorgeous and I know they are delicious!